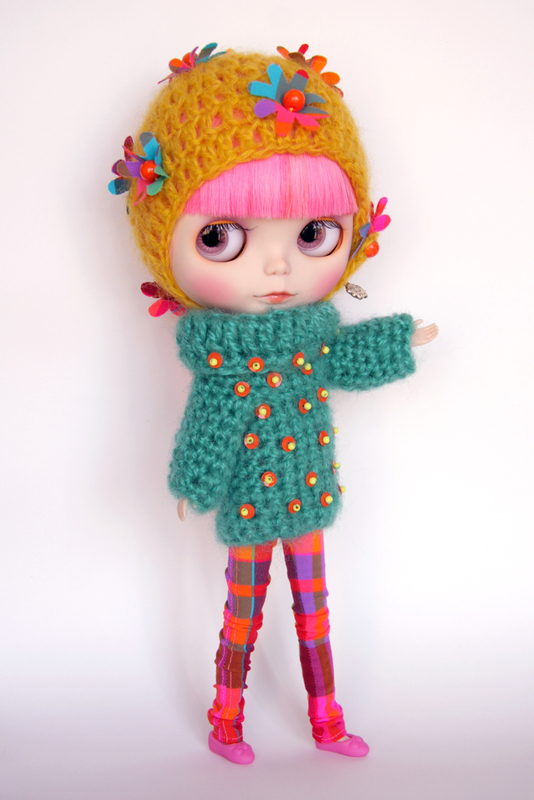 BambiMon Pop girl, an OOAK Blythe doll collaboration between Bambina Carabina & MforMonkey!!! I’m so happy happy to had the opportunity of working along with Mary, the talented, funny and sensitive girl behind MforMonkey:I had the chance of meeting her a lot of times and we have a very similar taste and love for pop colors, irony, music references and good laughs. We started talking abot doing something together during the last Bambole A Roma dollshow, when me and some dolly friends use to share the same cute/Japan culture lovers/ funny Bed&Breakfast from years, the Zolilla B&B , which I recommend for your stay in Rome (www.zolilla.it). 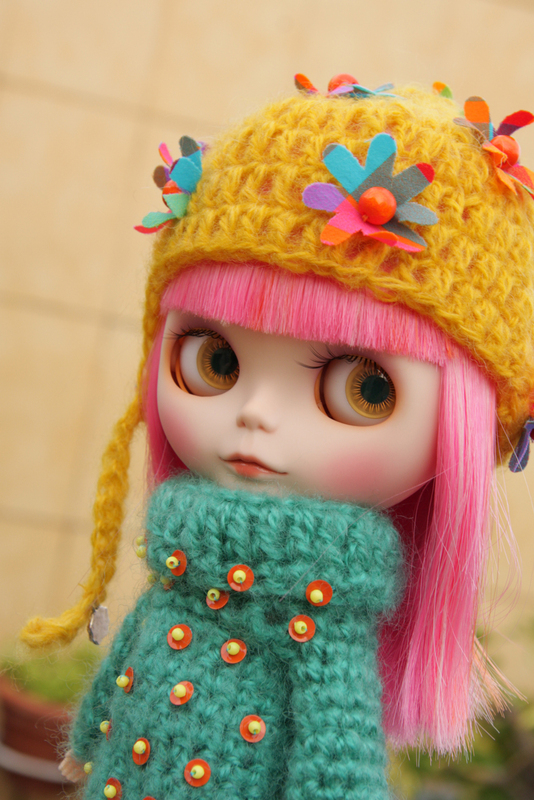 I had this poor Prima Dolly Guava that I’ve purchased because onestly I liked her hair and pale make up a lot, I had already sanded her, changed chips and eyelashes but she was not getting any attention so I thought she could be perfect for this poject!We called her BambiMon, from Bambina+Monkey 🙂 I hope you will like her as we do! 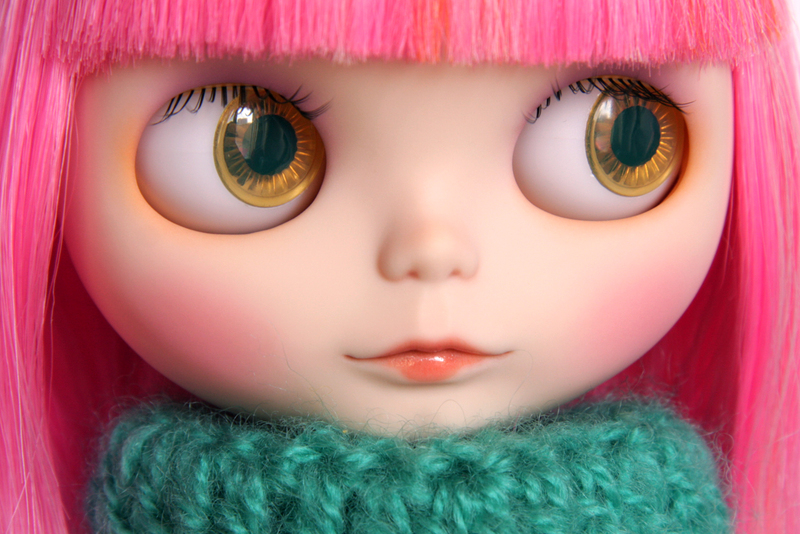 Her name is BambiMon, she’s a collaboration OOAK custom Blythe doll by Bambina Carabina & MforMonkey! She loves bright colors, smiling, having fun, pijama parties in the hotels, travelling, laughs, making noise and loud music! *A limited edition Bambina Carabina Granny Hat, hand crocheted in yellow mohair yarn, with hand cut pop colors plaid and orange painted 8mm wood beads. *Hand crocheted long roll neck sweater made from turquoise mohair yarn, studded by orange sequins and yellow glass beads, closed on the back with a wood 8mm bead. *A pair of colorful plaid pants made of lycra and cotton fabric, front and back working pockets, close at the back with a button and strap. *A pair of pink Licca ballerina shoes. ← “Silver Peace” a collaboration set between BC and Blythe Princess Designs for a friend in need! I love her!!!!!!!!!!! She´s really cute!!!!!!!! !